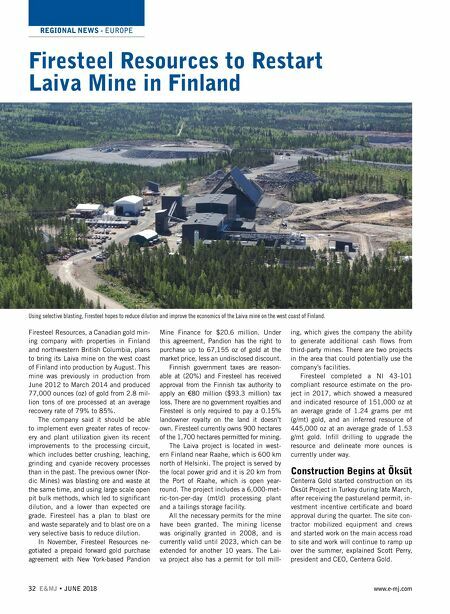 REGIONAL NEWS - EUROPE 32 E&MJ • JUNE 2018 www.e-mj.com Firesteel Resources to Restart Laiva Mine in Finland Firesteel Resources, a Canadian gold min- ing company with properties in Finland and northwestern British Columbia, plans to bring its Laiva mine on the west coast of Finland into production by August. This mine was previously in production from June 2012 to March 2014 and produced 77,000 ounces (oz) of gold from 2.8 mil- lion tons of ore processed at an average recovery rate of 79% to 85%. 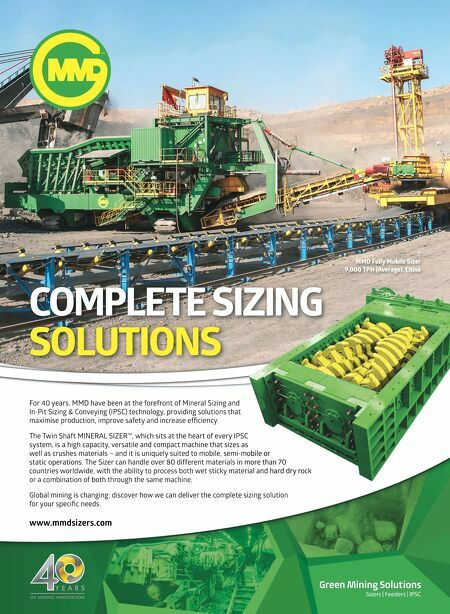 The company said it should be able to implement even greater rates of recov- ery and plant utilization given its recent improvements to the processing circuit, which includes better crushing, leaching, grinding and cyanide recovery processes than in the past. The previous owner (Nor- dic Mines) was blasting ore and waste at the same time, and using large scale open pit bulk methods, which led to significant dilution, and a lower than expected ore grade. Firesteel has a plan to blast ore and waste separately and to blast ore on a very selective basis to reduce dilution. In November, Firesteel Resources ne- gotiated a prepaid forward gold purchase agreement with New York-based Pandion Mine Finance for $20.6 million. Under this agreement, Pandion has the right to purchase up to 67,155 oz of gold at the market price, less an undisclosed discount. Finnish government taxes are reason- able at (20%) and Firesteel has received approval from the Finnish tax authority to apply an €80 million ($93.3 million) tax loss. There are no government royalties and Firesteel is only required to pay a 0.15% landowner royalty on the land it doesn't own. Firesteel currently owns 900 hectares of the 1,700 hectares permitted for mining. The Laiva project is located in west- ern Finland near Raahe, which is 600 km north of Helsinki. The project is served by the local power grid and it is 20 km from the Port of Raahe, which is open year- round. The project includes a 6,000-met- ric-ton-per-day (mt/d) processing plant and a tailings storage facility. All the necessary permits for the mine have been granted. The mining license was originally granted in 2008, and is currently valid until 2023, which can be extended for another 10 years. The Lai- va project also has a permit for toll mill- ing, which gives the company the ability to generate additional cash flows from third-party mines. There are two projects in the area that could potentially use the company's facilities. Firesteel completed a NI 43-101 compliant resource estimate on the pro- ject in 2017, which showed a measured and indicated resource of 151,000 oz at an average grade of 1.24 grams per mt (g/mt) gold, and an inferred resource of 445,000 oz at an average grade of 1.53 g/mt gold. Infill drilling to upgrade the resource and delineate more ounces is currently under way. Construction Begins at Öksüt Centerra Gold started construction on its Öksüt Project in Turkey during late March, after receiving the pastureland permit, in- vestment incentive certificate and board approval during the quarter. The site con- tractor mobilized equipment and crews and started work on the main access road to site and work will continue to ramp up over the summer, explained Scott Perry, president and CEO, Centerra Gold. Using selective blasting, Firesteel hopes to reduce dilution and improve the economics of the Laiva mine on the west coast of Finland.